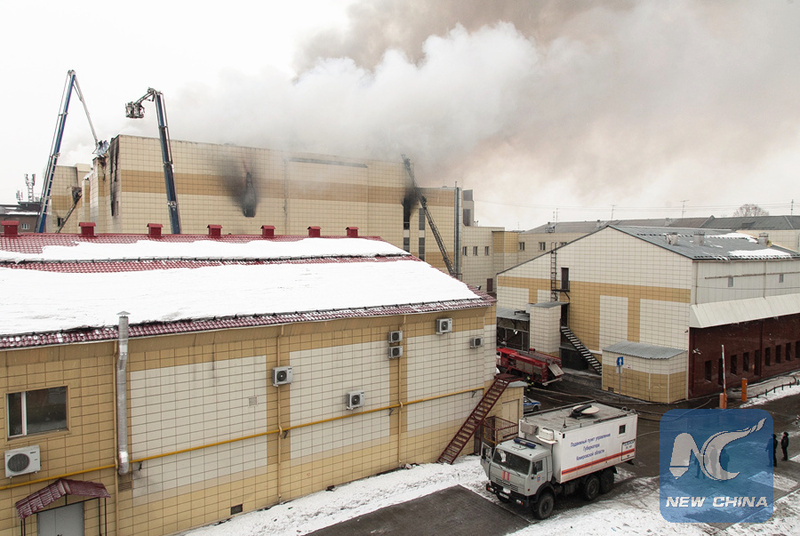 MOSCOW, March 30 (Xinhua) -- Two more people will be charged in the criminal case of a shopping mall fire in the Siberian city of Kemerovo, Russia's Investigative Committee said Friday. Tanzilia Komkova, chief inspector of the Kemerovo Region's construction watchdog, and Julia Bogdanova, general director of the Kemerovo confectionery plant which owns the shopping mall, were detained on suspicion of dereliction of duty, and will be charged with abuse of power and violation of fire safety requirements, according to the committee. Investigations showed that Komkova had not taken measures to stop the unauthorized construction of the shopping mall in Kemerovo, while Bogdanova did not adopt stronger safety measures despite repeated warnings by her subordinates, the committee said in separate statements. "Today Komkova and Bogdanova will be charged, and the investigation will petition for their arrest," the committee said. Five people have already been charged and arrested, including the head of the management company that provides services for the building and the tenants of the premises where the fire possibly started, it added. A major fire broke out at a four-storey shopping mall in Kemerovo in southwestern Siberia on Sunday, killing 64 people, including many children. It was one of the deadliest fires in Russia in recent years.